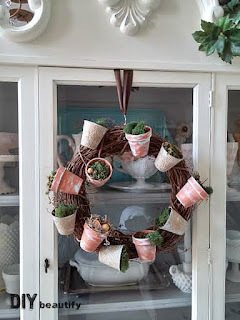 How many time have you wanted to hang a wreath on the front of a mirror or a cabinet door, but you didn't know how to do it in an attractive way? The only option out there seems to be to use a wreath hanger. Don't get me wrong...wreath hangers have their uses...but they're intrusive and often detract from your wreath. the cool features of this tip just aren't apparent by looking at pictures; you need to see it happening right before your eyes! So, although I am what you would call a video rookie, I enlisted the help of my son who's home from college for the summer and together we put together this little video for you. Bear in mind this was only my second video ever (as they were both done this week, the learning curve hasn't happened yet!) There are a few pauses...some nervous moments...some banging of the wreath...laughter, and at one point I even have a roll of carpet growing out of my head! But...if you can see past all the craziness, you will learn one of my favorite tips ever....how to hang a wreath from the front of a mirror or hutch with just one little clear hook! Goodbye wreath hanger! Without further rambling, let's get to the video and the trick that I promise will change your life (ok, not really, but it is a great little trick that you will use again and again!). This post contains affiliate links (*); click here for my full Disclosure Policy. I also promise to get better at these video things...and get the proper orientation!!! One important thing I forgot to mention in the video...even though it's kinda obvious, is that the 3-M Command hook* gets hung on the inside of your cabinet door or the back of your mirror...that's why it's invisible...it's not really magic...just seems like it! 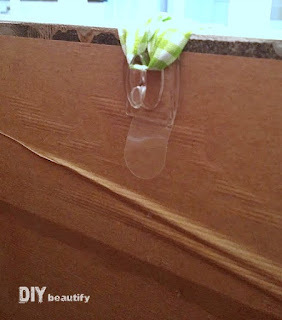 This trick is a real lifesaver for all of you who hate those intrusive over-the-door wreath hangers as much as I do. And if you really want your wreath to look like it's just floating there, instead of hanging your wreath from ribbon, try using fishing line! Was this tip helpful? Let me know! Keep following along...there's more decorating goodness ahead! I just started making your wreath and I am having such a fun time making it that I am anxious to get it completed! Thank you! I forgot to leave my email. It is mdrake63@gmail.com.